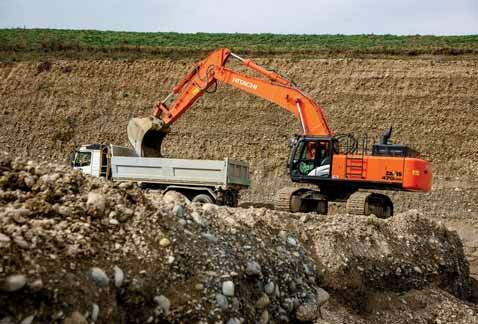 A Swiss civil engineering company has made a successful investment in a Hitachi ZX470LCH-5 excavator as the main production machine for its sand and gravel pit. The large Zaxis-5 excavator was delivered to Scrasa’s Satigny site on the outskirts of Geneva in October 2012 by the country’s Hitachi dealer, Probst Maveg. Formed in 1962, Scrasa was formerly a French company that helped to build Geneva airport on its first Swiss project in the same year. Scrasa became an independent company in 2007 and its 200 employees work across a wide range of projects, including the pit and its production facilities, as well as road construction, electrical utility, paving and microtunnelling projects. The ZX470LCH-5 is part of a fleet of construction machinery that includes two ZX225USLC-5s, a ZX135US-5 and a ZX85USBLC-5, but it is the only machine based at Satigny. It plays a key role in the excavation of up to 1,500 tonnes of mixed materials per day, loading two trucks for the maximum 2km haul to the yard. This helps Scrasa to produce 200,000 tonnes of washed materials for general building construction and a further 200,000 tonnes of recycled materials for road construction and concrete production per year. The four sizes of aggregates are 0.4, 4/8, 8/16 and 16/32mm, and they also mix products according to the needs of their customers and projects. After testing the ZX470LCH-5 against three other brands, Scrasa opted to add to its Hitachi line-up for three main reasons.“We continue to buy Hitachi excavators that offer value for money and top quality, supported by excellent after-sales support,” says Scrasa’s Jean Marc Zuccalli, who is responsible for managing the operations on the site. Experienced operator Pascal Notelle says that the machine is well suited to the work in the sand and gravel pit. “There are many different layers – including compact and hard soil — but the ZX470LCH-5 is able to dig into all of the materials easily. I also have to mix the different grades by dragging the bucket down the face of the pit and the machine has more than enough power to complete this task.